I was wondering if Sparrow Road would provide another native Iowa sparrow this morning. Sparrow Road came through, with a chipping sparrow. The chippy's cap is a stronger red than that of the field sparrow I posted yesterday. 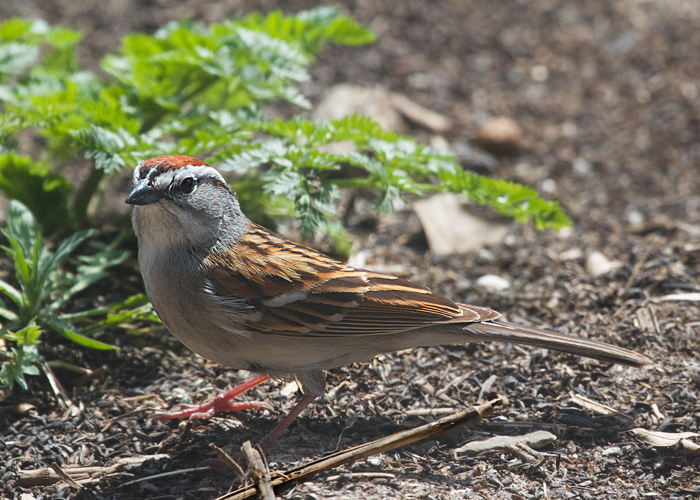 The chipping sparrow also has a strong black line going back from the eye, and a strikingly white eyebrow. If you want to be highbrow, you can call that eyebrow a supercilium, which means... eyebrow. Super means above. Cilium means eyelash. So it's a line that is higher up than the eyelashes. Like eyebrows.